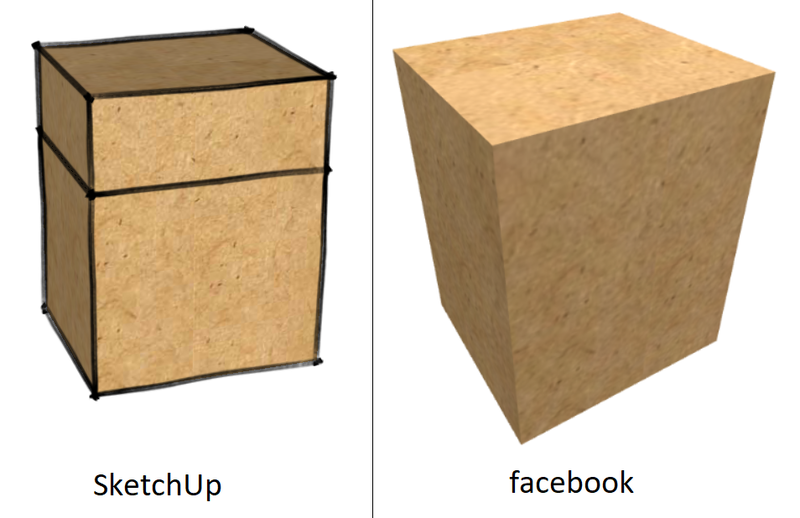 I'm trying to show a 3D model on Facebook and display its edges and lines. I found that I could export a 3D model from Sketchup using glTF Export plugin to a glb file that I can drag and drop in a Facebook post. I tried many ways to set material, width, styles on lines in my model but once imported in Facebook the lines don't appear. It's not a Facebook problem since the gtTF viewer has the same display. I also have the same rendering problem by ubloading an stl file to Sketchfab. Is there a missing implementation in glTF format? Is there another freeware to export a 3D model to Facebook (showing edges)? 3D graphics are not images they are instructions for images. Now the formats that export data beween systems work on lowest common denominator. Geometry is fine, but any effects on top of geometry would require you to agree on a set of instructions to implement. (no such reffort has been made for npr rendering lines). The lines are not really part of the model that has been exported trough the gltf pipeline. Simply because the line rendering is a special feature of the sketchup system. There is no generic format that support those, since they need to be generated frame by frame. And there is quite possibly a infinite number of such features that could be implemented, none of these are part of the generally accepted set of things to export. Most likely your out of luck the engine in question simply has no way to do this. So there is no solution for your problem. STL is a even more rudimentary format it only has triangles nothing else. Not the answer you're looking for? Browse other questions tagged rendering 3d or ask your own question.